If you come here very often, you've probably noticed that I participate in a lot of challenges. A lot! I really love that the inspirations and prompts offered up are usually ones that I wouldn't have selected for myself, so they push me to think outside my own box. That out-of-the-box thinking often involves agonizing over what to create to do justice to the inspiration. However, there are other times when one of these inspirations immediately speaks to me and there is no overthinking. 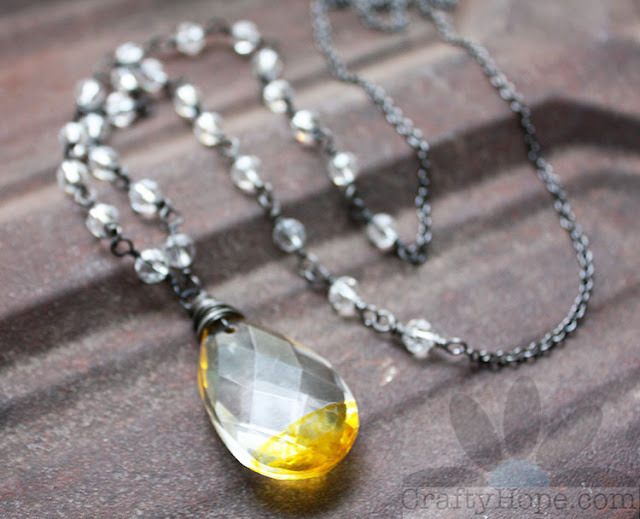 That was exactly the case with this month's Honey Do List from SJ Designs Jewelry. As soon as I saw Eric's picture, I knew what I had to make. Okay, so here's the picture Sarajo shared. The squares of stained glass reminded me of facets on a crystal, specifically a chandelier crystal. And, I knew that I could add a touch of yellow to complete the look of that amazing roof. Using dark annealed steel wire enhanced the feel of the lines in the glass. 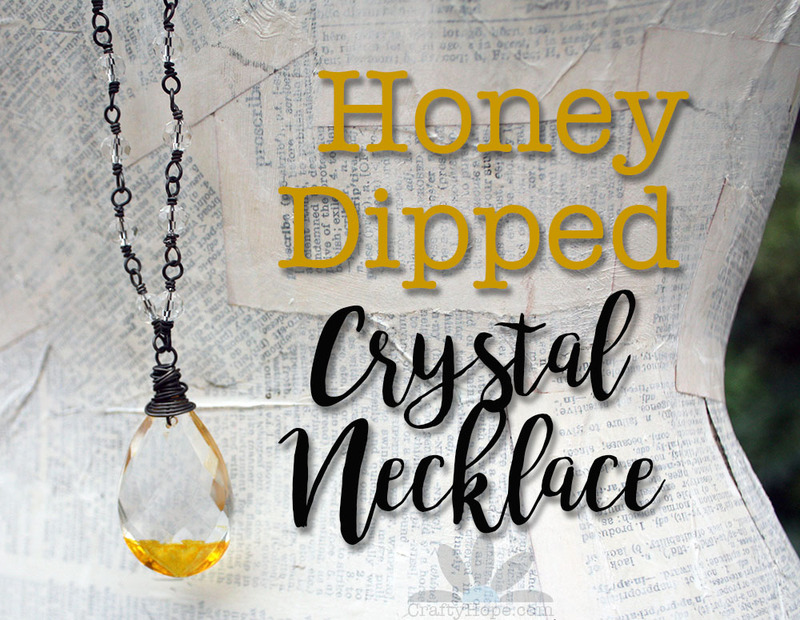 My path to complete this Honey Dipped Crystal Necklace was so clear, I actually recorded the process I used to create it. I'm absolutely delighted with the whole design. The golden hue of the Sunshine Yellow alcohol ink plays tricks within the facets of the crystal. So, the pendant looks a little different from every direction. 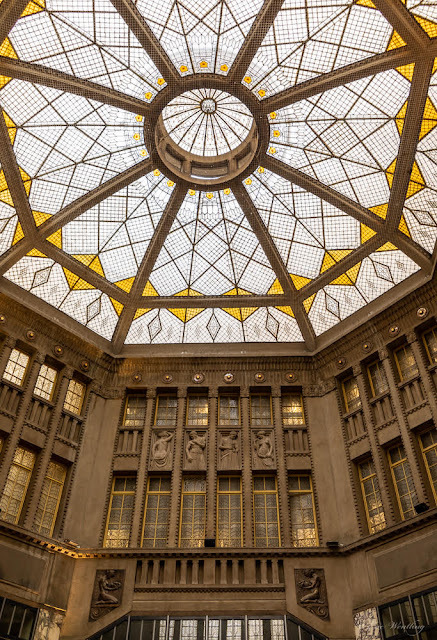 I'm glad I narrowed my focus to the stained glass roof and didn't try to draw from some of the other colors and shapes in the building. I don't think I would have been as happy with the result as I am with the simplicity of this. If you're not interested in watching the above video, my steps to make this necklace were simple. I used washi tape to seal off the bottom section of a vintage chandelier crystal. Then, I painted it with the alcohol ink and peeled off the tape. After testing a few different sealers, I painted on some clear nail polish. 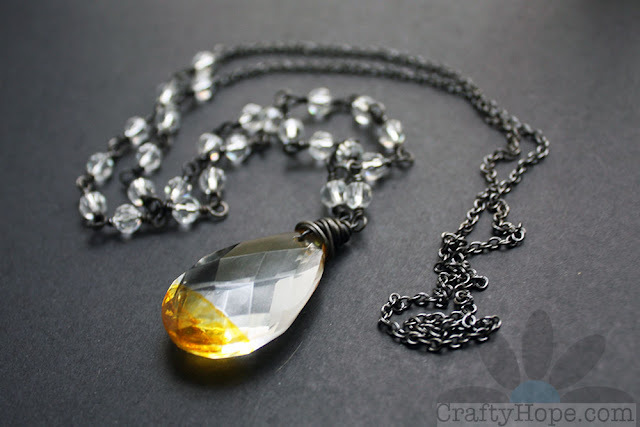 From there, it was just a matter of creating a bail, wrapping the beads, and adding the chain. My thanks go out to Sarajo and Eric for another awesome inspiration. I was indeed inspired! Please head over to SJ Designs Jewelry to see how Sarajo and any other participants interpreted the inspiration. I'm also sharing this post at the following link parties: Mad in Crafts, Beautifully Made Link Party, Talk of the Town, Handmade Hangout, Flaunt it Frida , Saturday Sparks, Saturday Sharefest, and Mad Skills. Divya, Thank you! I knew what I needed to make immediately. That's so rare for me, but it was a pleasant surprise! I can see how the inspiration could be a challenge since the palette was just a few colors, and you tend to work in a variety of bright, bold hues. I appreciate you taking the time to come by and see what I created! Altering that crystal with alcohol inks is the key, so very clever plus minimum materials used! 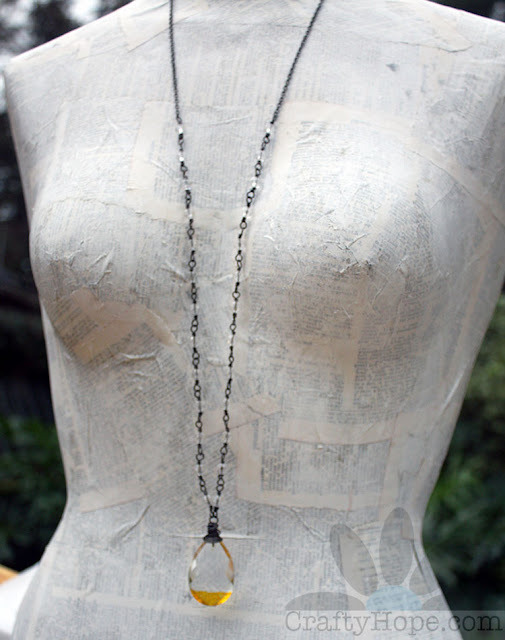 This necklace proudly stands up to the challenge! That's so pretty! I watched the video and was surprised to see that you used nail polish. It really does work great as a sealer. I sometimes use glitter polish to enhance my painted rocks. I have a friend who wondered what to do about chips in her white tile kitchen floor because she thought they looked like dirt. I told her to use some white nail polish to touch up the spots and she thought that was a great idea. Lorraine, Thank you. Yes, as you saw, I tried several sealers. And, it was the best at holding the color and not wiping the ink off (one I didn't share did just that!) Alcohol ink can be fickle and I didn't want the chance that it might bleed off the crystal And, in all honesty, nail polish is an enamel... I'm glad to hear you use it too. I can see how weatherproof it would be for the paint on your rocks! Thanks for the support. I wonder how crazy some people think I am with some of my methods. Ha! Beautifully done Hope! I love the dipping of the ink and how it looks different depending on the angle. 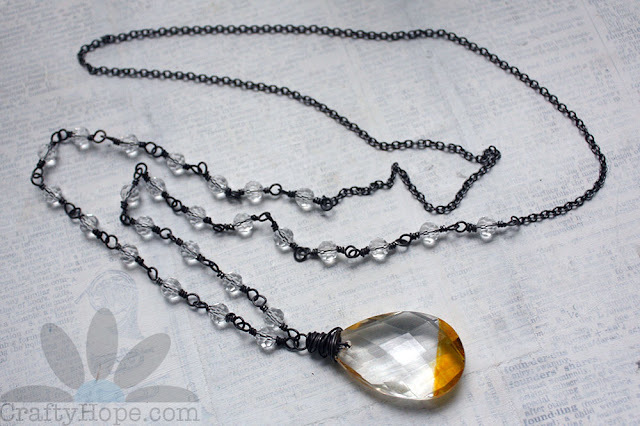 The necklace has such a great overall antiqued vibe! I love the necklace and it is perfect for the inspiration piece. Thanks for sharing your method for altering the crystal. Well done! Yup, this is about perfect! Thanks for sharing your process! Thanks Eric! I was surprised how quickly this idea came to me. Yellow is usually not a color that I can work with, but your inspiration definitely hit a cord! Thanks for that. 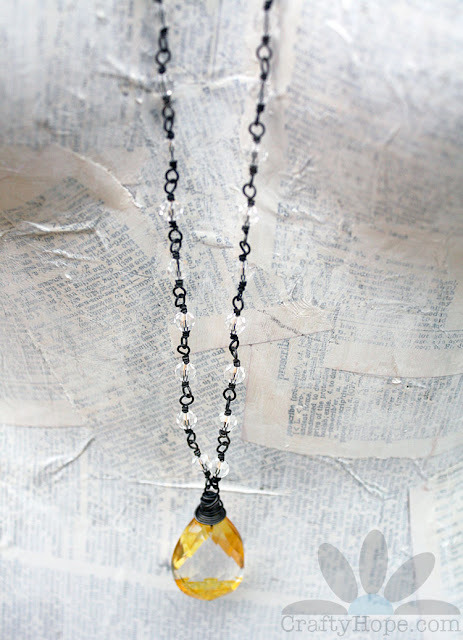 Hope, I'm completely smitten with this necklace! It is perfect for Eric's photo in every way! Simple elegance at its best. Sorry for the date confusion (mine)... my brain seems to have vacated the premises. I appreciate your patience and for playing along with us! Check back to see what he dreams up for February. Sarajo, Aw, thanks! I know you've had a lot going on this month (what with getting added to the ABS team - so awesome!) and no harm no foul. Can't wait to see what's next from y'all! !